Momice has 6 modules: Mail, Registration, Website, Survey, Tickets and Statistics. You decide which features you want to use – view them below. Automatic event registration, including workshops, extra guests and waiting list. Send professional invitations and follow-up emails in the style as your event. Perfect representation on all smartphones, tablets and computers. Check-in your attendees by scanning their e-ticket with any smartphone. View the results of your website, mailings, registration, tickets and survey. Create, manage and sell entry tickets to all your events. A handy shortcut to the website on any smartphone, including own app icon. Let others invite their contacts, while you maintain overview and control. Let visitors register for workshops and set a maximum number of registrations for each workshop. Easily create separate lists and tickets for different audiences. Enable your visitors to contact each other. Networking has never been so easy. Determine how many tickets you want to hand out, before closing registration automatically. Create your own survey with different types of questions. Decide whether you open the registration to everybody - or to those with an invitation. with a single, simple question. Design your own registration page. Your attendees always get the latest information. Show the key speakers who will attend. 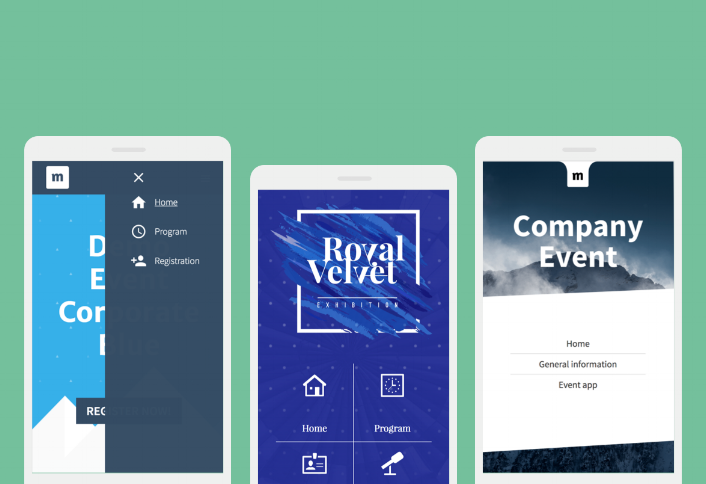 Style your mobile representation and choose from 3 different app menus. Secure your website with a password if desired.